Since the Deepwater Horizon offshore rig exploded and sank in April, BP has devoted inadequate resources to the oil spill response, withheld information from the American public, and denied access to spill sites to journalists. So our ship the Arctic Sunrise is heading to the Gulf to do an independent assessment of the impacts. We believe it’s way past time the full, unabridged truth about the extent and nature of this oil catastrophe was told to America and the world. The reports coming out of Louisiana about cleanup workers and even local police helping BP enforce a media blockade have been nearly as frustrating as watching the oil spew into the Gulf without cease for almost three months (a hat tip is most definitely deserved here to Mother Jones’ Mac McClelland, who has been chasing this story all along and doing a great job of reporting what’s happening on the ground). It’s in BP’s best interest to limit media access to oiled beaches and wildlife, as the more they can contain the truth about just how much damage has been done, the more they can limit their liability to pay for that damage later on. We released our ScamWow video last week to highlight this very sad and galling state of affairs. 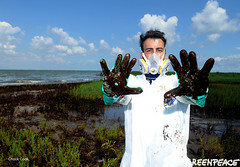 View more images of the BP oil spill in the Gulf of Mexico. We’ve also had a team on the ground since the start of the disaster, tirelessly investigating local beaches and coastal ecosystems to take measure of the extent of the damage. Our team has taken copious photos and posted numerous oil spill updates on our blogs to make sure folks can see for themselves just what BP has done to the Gulf. But BP is cracking down on public access more than ever, so we’re stepping up our efforts. The Greenpeace ship Arctic Sunrise is on its way to the Gulf for a three-month expedition to document the true impacts of the BP Deepwater Disaster on the Gulf’s marine life and unique ecosystems. This tour is especially crucial now because even if BP has finally capped the leaking well, the crisis will continue for some time, endangering wildlife and ecosystems, destroying the region’s fisheries, and affecting the ocean for decades to come. It’s important that we not let the focus shift away from the truly extensive catastrophe that is still unfolding in the Gulf, whether more oil is spewing out of BP’s well or not. The Sunrise will leave Tampa, Florida during the week of August 9th and visit the Florida Keys and the Dry Tortugas before approaching the wellhead during the first month of the expedition. The crew aboard the Sunrise will be examining everything from the plankton on the surface to the subsurface plumes and the deep-sea corals on the floor of the Gulf. The Arctic Sunrise is a 50-meter long, icebreaker ship that was purchased by Greenpeace in 1995. Since then, it has peacefully protested whaling in the Southern Ocean, documented climate change and glacier melts in the Arctic, and was the first ship to circumnavigate James Ross Island in the Antarctic, which was an impossible journey until a 200m thick ice shelf connecting the island to the Antarctic continent collapsed. Throughout the expedition, the Arctic Sunrise will host independent scientists and researchers who will be looking for oiled marine mammals, turtles, fish, and sea birds. Charles Messing and Jose Lopez from Nova Southeastern University will be on board looking at sponges, which filter large quantities of water and are therefore useful for looking at sub-lethal impacts of oil and dispersants. We’ll announce other on-board scientists in the coming weeks. So keep checking back on this blog for live interviews with our onboard campaigners and scientists, video and still photography from the Gulf, and an interactive, web-based Virtual Ship Tour that will allow you to come along for the journey. In the meantime, you can help by calling for an Energy [R]evolution. Next: Deep Green: Gulf of Mexico, The Cost of.. Previous: Electronics-makers, show us your..
What a Joke... where have you been Greenpeace? R U Bought off from some entity? This is the first media report from your port that I have seen. Shame. Where are the independent air and water reports from the Gulf of Mexico on your site? I would like to know. U R No better than the beltway in DC. Shame. Get real and do some real work on the Gulf Coast (Gulf of Mexico). Pick up some of "Matt Simmons" work and do some Real reporting, otherwise, stay away. "You will do more damage than what has already been done." Where is your info on the "BP oil spill" I do not see it on your official website? Great- putme to work. I spent over 20 years working in environmental chemistry testing for hydrocarbons, PCB's and metals. I would be more than happy to help!